On the same night every autumn, they roam among us, threatening to take away all we hold dear and plunge us into a world of darkness. They reject joy and rejoice in our despair, hoping to spread their malevolence far and wide. We're talking, of course, about the world's very worst kind of people: people who refuse to dress up for Halloween. There are always a wide variety of excuses. "I couldn't think of anything good," they might say. Or "I had an idea, but I just never got around to it," or "I was just too lazy to put something together." Or that old standby: "I just don't care about Halloween." But don't worry, because this year, those people have no excuse. Now, finally, there's an answer for people who complain about Halloween being "too much work," and it's even easier than buying a cape and a plastic set of fangs for approximately $3: the ugly Halloween sweater. Cosmopolitan recently wrote about a new sweater collection from HalloweenCostumes.ca, which approaches Halloween with that unmistakeable ugly Christmas sweater aesthetic: they're loud, they're bright, and they're deliberately tacky. But instead of featuring reindeer, snowmen, or drunk Santas, these ones boast ghosts, witches, and pumpkins galore. And these are hardly the only options out there. Tipsy Elves also offers sweaters adorned with skeletons and ghosts. These sweaters "won't exactly make people break out in a cold sweat," according to the website, "but they sure do make us laugh." If you want the real deal, rather than something made with the intention to be obnoxious, try thrifting. EBay is rife with the kind of woollen monstrosities perfect for a Halloween that's cozy and tacky in equal measure, as is vintage retailer Ragstock. 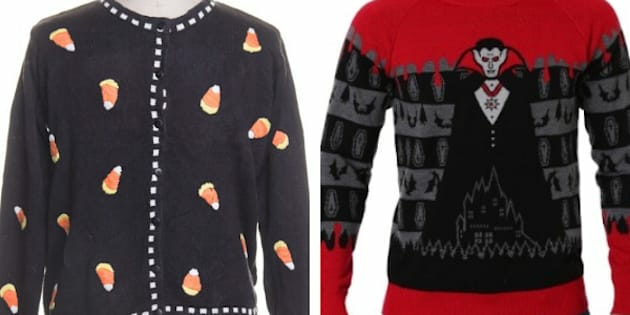 There's a big range in prices, allowing you to spend big bucks on an ugly Halloween sweater if you decide it's a priority, but offering more accessible price points, too. So this year, don't let anyone tell you that they're too lazy to dress up, or that Halloween is too much work. Instead, calmly and rationally tell all your friends that they're perfectly welcome not to dress up for your Halloween party, because you have a closet full of wool sweaters adorned with ghosts that anyone is welcome — nay, encouraged — to choose from if they show up without a costume. That'll show them. But don't go too far and make anyone wear an ugly Halloween vest. You aren't a literal monster.